Such are the nuances at play within natural winemaking in Beaujolais that the two young winemakers of the two families of the Château de Grand Pré, Romain Zordan and his cousin Yann Bertrand, express very distinct voices in their work, despite organically farming the same terroir, sharing much of the same cellar and equipment, and benefitting from the advice of some of the same mentors. The differences in the wines are to some extent a reflection of differences in age and temperament. Yann Bertrand is a better student of biodynamics. Romain Zordan gets more invitations on hunting trips. 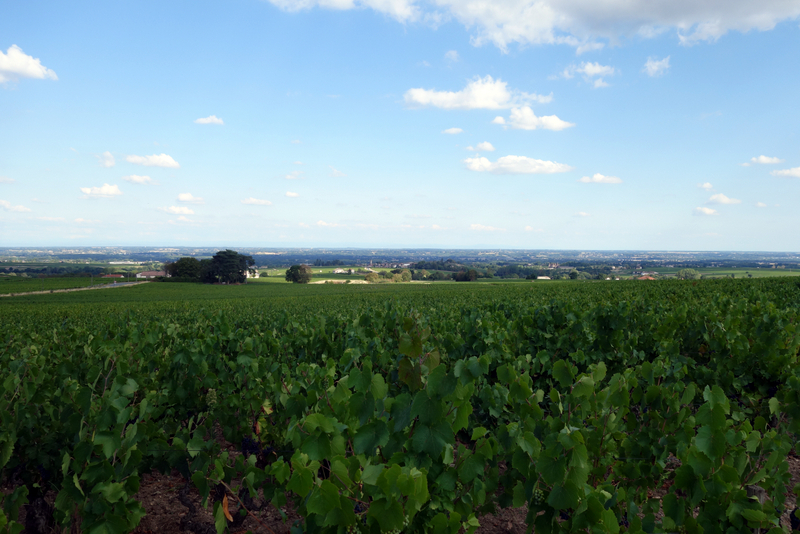 Beaujolais is all the richer for containing both approaches. 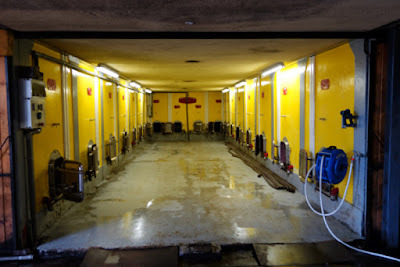 Bertrand's wines have seen rapid success with his embrace of the aforementioned farming methods and of rigorously-controlled, cool-carbonic maceration techniques. 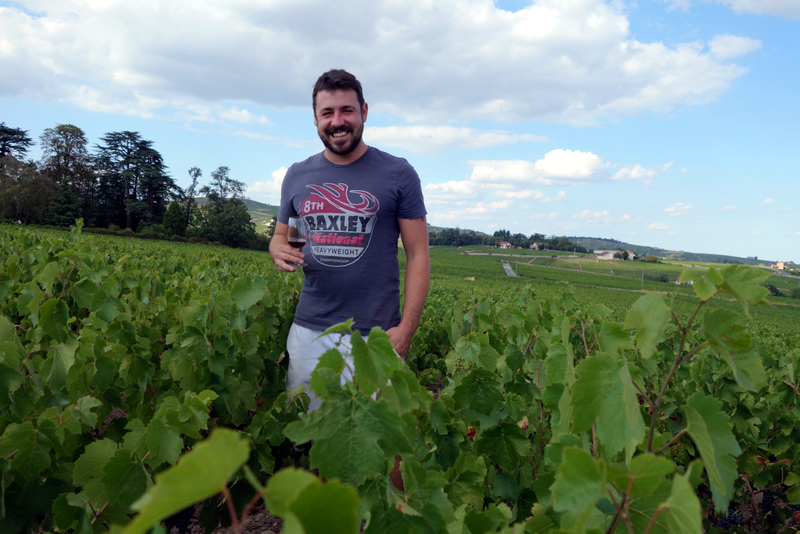 Romain Zordan, at 29 the elder of the two winemakers by a half-decade, has been slower to adopt the same practices, though he appreciates their impact and applies them in certain cases. 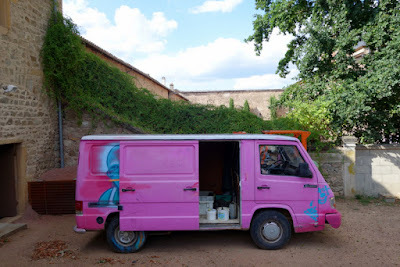 He's a genial, salt-of-the-earth dude whose empathy with the wider Beaujolais wine community seems to moderate his work at the side of the domaine he farms with his father Claude. Yet the wines he's making are already formidable and, indeed, necessary to an understanding of the terroir of Grand Pré. 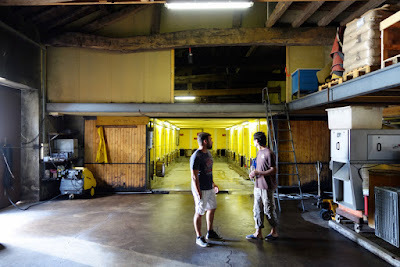 Romain (left) and a friend of his in the cellar the former shares with Yann Bertrand. Before returning to work alongside his father in 2012, Romain Zordan previously maintained his own domaine from some rented vines in the Grille-Midi lieu dit of Fleurie from 2007-2009. He cites it as a learning experience. He had fantastic terroir there - the vines were adjacent to those of Yvon Métras. But at the time Zordan, having not had much experience in natural winemaking circles, employed select yeasts in fermentation and filtered his wines. 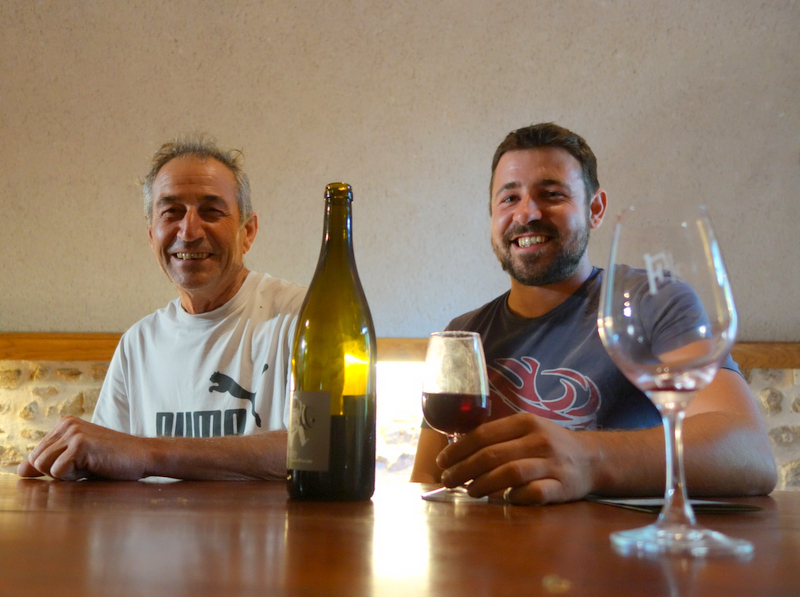 When his relationship with his then-girlfriend ended, Zordan decided to travel, working in Australia and at Domaine Vincent Girardin in Burgundy for a time before returning to Fleurie. Guy Bertrand and Claude Zordan stopped herbicide and pesticide treatment at Château de Grand Pré in 2000, and the domaine became certified organic in 2008. 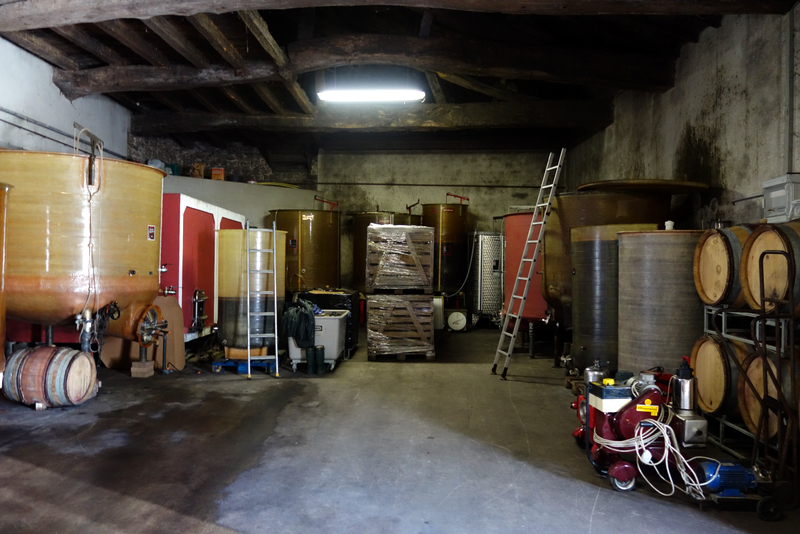 Romain Zordan takes an interest in biodynamics, racking and bottling according to the lunar cycle, but he has yet to attempt to implement the system in earnest. "I think it’s a good thing," he says. "But these are levels to which I gravitate little by little. For now I try to apply myself on the wines. We’re in organic, it’s already not easy to manage. Biodynamics - that’ll come after." Romain and Claude from their half of the domaine produce a basic Morgon and Fleurie, as well as old-vine cuvées of each, a small-production old-vine Fleurie cuvée called "Cuvée Spatiale," and a tiny amount of Beaujolais from Charentay, vinified as a primeur but sold as both Beaujolais Nouveau and Beaujolais tout court. Stylistically, the "Cuvée Spatiale" stands out for its length and complexity. 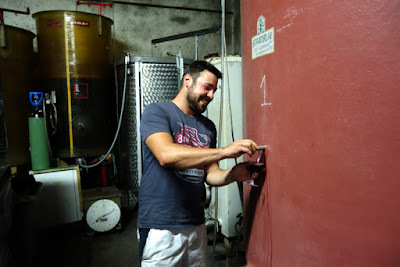 I first tasted the 2013 at the Rue89 tasting in spring 2015, where Romain took care to serve it from carafe, following what he saw as an excess of oak barrel influence on that first vintage. Alone among the Zordan range, the wine undergoes long (28-day) , cool carbonic fermentation in a spherical fiberglass tank, known locally as a "sputnik." The 2014 was then aged in old oak demi-muid, with generally even better results, especially on the second bottling (July, as opposed to March). It's long, gourmand, with a sweet licorice and blueberry tones dappling its svelte red fruit. The wine derives from Zordans' oldest vines, around 70 years old, on viala rootstock. "You have very low production and super good grapes, always small," he says of the parcel. "It's always a pleasure to vinify." 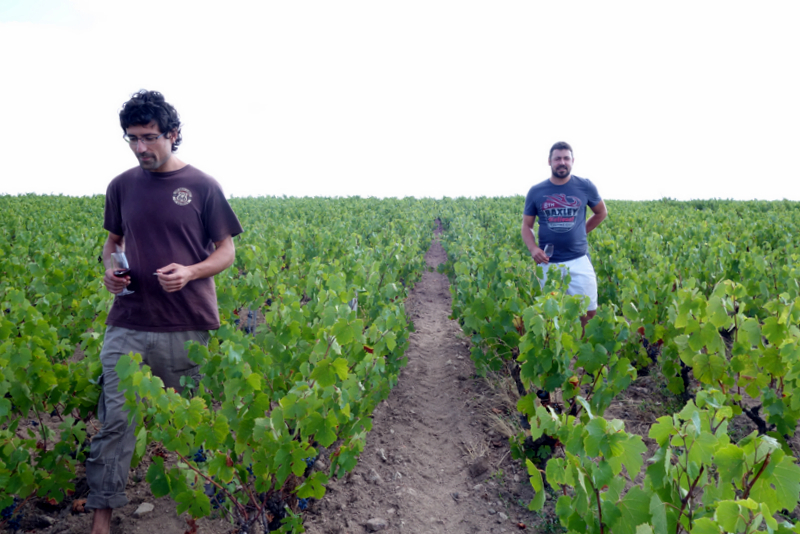 Romain and his friend in the parcel of vines used for the "Cuvée Spatiale." The basic Beaujolais, which along with the "Cuvée Spatiale," sees no sulfur throughout vinification and bottling, was also very intriguing, showing a breadth and tannicity one rarely associates with basic Beaujolais from that more argileux terroir. A bottle opened the day before had become supple and refined. Romain's harvesters painted his truck. 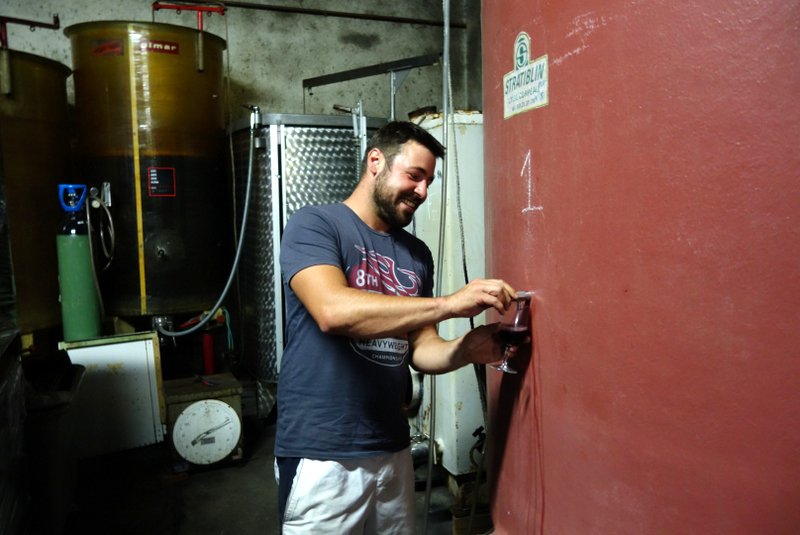 By his own easy admission, Zordan is still finding his voice as a winemaker. Where in 2013 he fermented to a rather low sugar density before pressing, in 2014, seeking a lighter, fresher style, he pressed much higher in sugar density. "I adore the wines of Jean-Louis Dutraive - the style, which is very light and drinkable. I asked how does he manage to make wine like that?" he explains. "I'm very happy with 2014. But is there the vintage that plays a role too? I think there are lots of parameters that are there to take into account, of which I’m not yet he master, for now." Like his cousin, Zordan had a trying 2015, with yields just over 20HL/HA and issues with brettonamyces. The two share a cellar, and under a microscope bret was also detected in Zordan's tanks. Unlike Bertrand, however, Zordan preferred to take his chances and forgo pre-filtration, because the bret remained imperceptible on nose and palate. "I believe in my nose," he said in November of the at-risk tanks. "I still taste them twice a day and still don't get the bret." I sense that, in shared cellar facilities, differing approaches to managing bret risk can be a source of friction now and then. Where Yann is intellectual and exacting, Romain's approach is instinctual and somewhat more hands-off. Each is coping with the travails of 2015 in his separate way. In November, Zordan had one particularly problematic tank that wasn't finishing its sugar and tested alarmingly high in volatile acidity. He put it in tonneaux because the lees in the tank were spent. He's hoping the sugar will finish in the spring. "Working naturally, at worst, you enjoy the vinif," he says wryly. 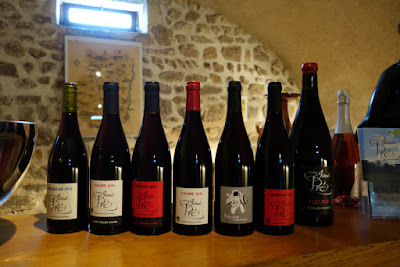 "Then, of course, you have to sell it..."
A short run-down of the wines Romain Zordan showed at the June 2015 Rue89 tasting at Wine Terroirs. Bert also enjoyed the 2013 "Cuvée Spaciale."